Quite often, when mainstream media outlets portray Sikh functions or services, the reporters commonly make a note of the Sikh practice of langar, the free kitchen and food made available to all who attend the service. They say there’s no such thing as a free lunch, but a staple at Sikh temples, or gurdwaras, across the world is the langar, a kitchen where food is offered without charge. Here it’s available seven days a week, 5 a.m. to 11 p.m.
And it’s tasty food (if you have a penchant for a little spice and don’t miss the meat). Vegetable curries and dal, plenty of rotis to soak it all up and an array of sugary Indian sweets. 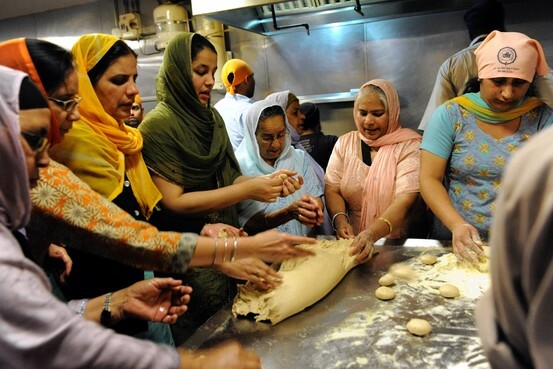 For the uninitiated, this article provides a behind-the-scenes look at langar. It’s also a common way to report about langar – describing it as a free meal and making note of what is offered. The practice of langar – as old as Sikhism itself – involves people of all stripes sitting together side-by-side, in the same way (usually on the floor), and partaking of a meal. It is a Sikh expression of equality, humility and service to others. Certainly, the food is important, but in my mind, the significance of langar is its meaning and not as much about the actual food. Yet, this significance is not clearly reflected often enough. Instead, we read stories that espouse our free, delicious, spicy, exotic, vegetarian food (bonus points if the stories mention boiling hot and sweet Indian chai), and that we love to give away these richly-prepared free meals to all, 24 hours a day and seven days a week. Perhaps it’s the attraction of free Indian food (see the commentary by the blog Gothamist about the Wall Street Journal piece), or the ignorance of reporters, or our own failure to provide an accurate representation of what langar is (and I may be guilty of this myself) that is to blame. However, when we distribute such articles through our social media networks, we need to make sure that the significance and meaning behind our practices are communicated, rather than just to celebrate the promotion of the physical ritual itself.